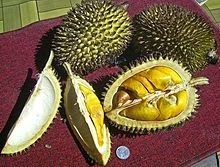 Durian is famous for its foul smell; thus, a lot of people have not eaten this exotic fruit because of it. 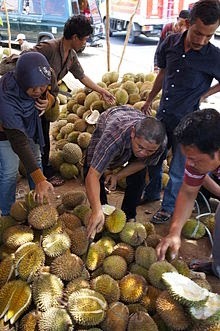 The odor of Durian makes the fruit not mouthwatering to some people; hence, they do not get to experience eating the creamy and sweet flesh coated around the seed. On top of that, by denying themselves the opportunity of eating this fruit in their entire lifetime, they deny the many health benefits this fruit can offer to their body also. Yes, some people had it all wrong when thinking that the only benefit one can derive from eating durian is increase in libido. Eating almost one cup of durian fruit is already equivalent to nearly 48 milligram of Vitamin C and that is per estimate, 80 percent of the recommended daily allowance of vitamin C in our body. As you all know, Vitamin C is the key in collagen production which is a protein that helps cell growth and activate blood vessels and in turn gives the necessary firmness to your skin. Thus, one can conclude that durian is an excellent natural anti-aging fruit for your body. An added bonus is that, the fruit has important antioxidant properties that protect people from incurable diseases like Alzheimer’s disease and cancer. Durian is rich in calories but it has zero cholesterol. This fruit belongs to a rare category of fruits that is rich in fat and calories like coconut and avocado. Thus, this is one reason why people are discouraged to eat this fruit as they are conscious about gaining weight. But, the truth is that is the fat this fruit has actually helps lower bad cholesterol. Eating a conservative portion (one small fruit and not two large ones) will not add weight. This fruit has very high level of dietary fiber which is important for various functions and systems in our body specifically, the digestive system. Fiber is the reason why there is an increase in bulk of bowel movement. Thus, eating creamy durian flesh helps reduce constipations, intestinal blockage, bloating conditions, excessive flatulence, cramps, heartburn, and indigestion. As the fiber in durian flesh is insoluble, it also helps reduce frequency of diarrhea for people who are sensitive to this health condition. One more thing, fiber is an excellent natural way to scrape bad cholesterol out of your body before it starts to develop plaque build-up in the cardiovascular system. According to several clinical researches, a low amount of serotonin could help trigger depression. Durian is rich in natural Vitamin B6 which is an important element in producing serotonin. Thus, it is advisable to eat durian in order to increase levels of serotonin and helps fight depression naturally. In Mindanao, when durian is in season, its price can go as low as P25.00 per kilo. 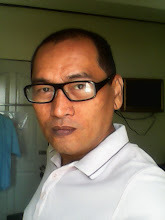 It is indeed a cheaper way to fight aging, depression, improve digestive system, and reduce bad cholesterol in your body. So, it is not only an aphrodisiac, it has lots of healthy benefits as well.